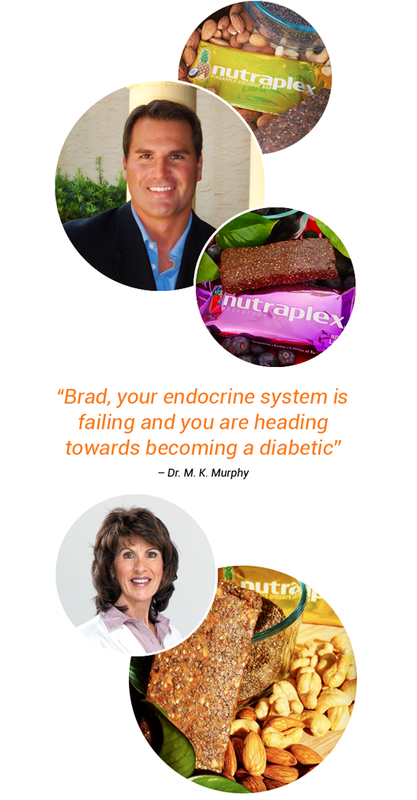 My name is Brad Fowler, creator of the Nutraplex bars. As a life-long athlete I've enjoyed good health, but eventually I ran into a brick wall. A wall created by my own body and what I put into it. And it became difficult to keep off the extra pounds, despite being active. I was tired all the time and it seemed the harder I worked, the further behind I found myself. A doctor visit was eye opening and life changing. "Brad, your endocrine system is failing and you are heading towards becoming a diabetic," my doctor told me. Incredulous; I listened as my doctor insisted I make drastic dietary changes: avoid gluten, ditch refined sugar and processed foods, eliminate trans fats and GMOs. Seek to consume more of the key nutrients your body needs. And start now! Meals at home were easy. I stocked up on nuts and fresh veggies, while avoiding the “inner aisles” at the grocery store where the processed foods lurk. But finding a tasty, portable, go-with-me-anywhere snack packed with nutrients? It was almost impossible. From that desperation came the idea for Nutraplex Bars. I spent countless hours talking to doctors, nutritionists and food scientists, seeking the best ingredients and food combinations. After a year of research I went to the drawing board and formulated my own snack and energy bars—Nutraplex, I call them. Each Nutraplex bar packs plenty of flavor and is chock-full of nutrients. Finally, a healthy and tasty snack bar that I could take to work, the gym and even on the road when I travel. Out with gluten, refined sugars and over processing. In with carefully concocted blends of healthy nuts, chia seeds, sunflower seeds and antioxidant-rich dried fruits, not to mention unique flavors that get raving reviews. I was on the bike trail with a friend who was enjoying my bars when he made a comment that stuck with me: "Wow Brad, you should make these for everybody!" So now I do. Bikers, hikers and runners love them for the portable convenience and amazing ingredients. And mothers love them because they’re good enough to pass the “yuck” test for kids.